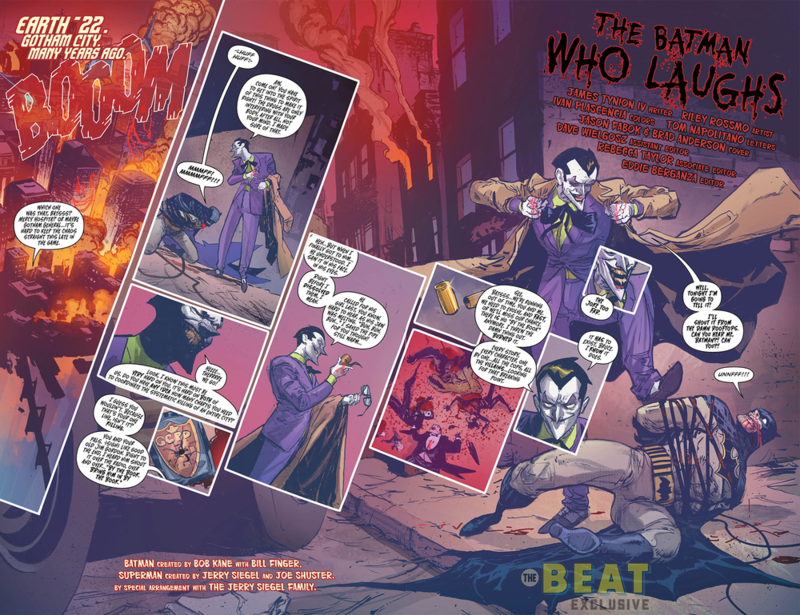 Who is the Batman Who Laughs? All of the evil Batman that have come from the Dark Universe have been interesting but none has been more mysterious than the Batman Who Laughes. This is the evil Batman that seems to be part Batman and part Joker and has also been integral in recruiting all of the other evil incarnations of Batman. How did this twisted form of Batman come to be? Who exactly is it beneath that mask? Everyone can find out November 15th! You can check out the first couple pages below and I can see that I love how it begins. All of the Metal Batman Origin one shots have been hits with them all landing on the 10 sales charts and I fully expect this one to be the most popular book of them all. In this dark universe of the DC world Joker has achieved perhaps what his ultimate goal has been all along. Combine his own insanity and out of the box thinking with Batman. The result of this combination is a character that may be the most terrifying villain in the DC universe. Yes this villain has potential to be worse than a Dark Seid and even the dark god Barbatos he supposedly follows. The story of how this Batman comes to be is the darkest origin story yet of the evil Batman and also perhaps the best twist on the Batman/Joker mythos. There are elements in this story that will be talked about by comic fans for many years to come. 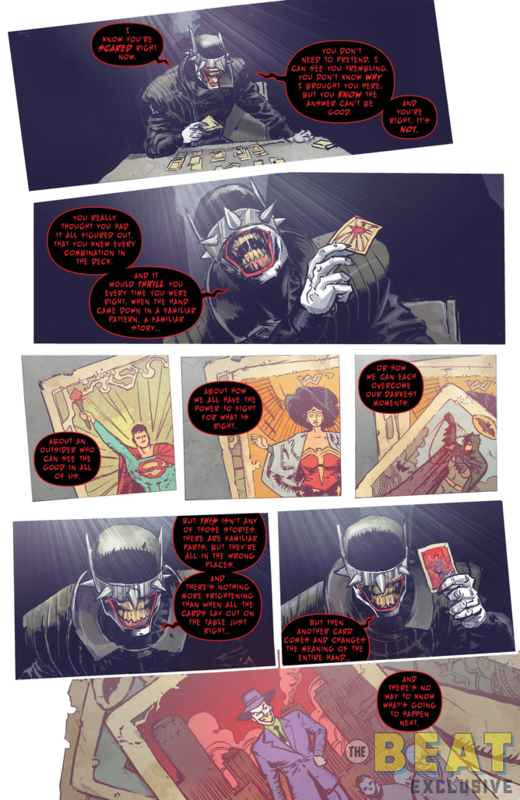 The Batman who Laughs is the narrator of his own origin and he is relaying it to a mysterious bandaged faced man whose identity is not revealed. The story begins with Joker basically having won. He has incapicated Batman and killed many, many people. Gotham is literally burning and under the Joker's control. It is not clear exactly who all he has killed but certainly a huge swath of Gotham is dead. Joker revels in this with extra excrutiating form of torture for Batman. He brings Batman to an alley and has families come down with two parents and one child. He then guns down both of the parents in front of the child. As the child is horrified at the loss of her/his parents the joker splashes the joker laughing chemical on them. Making the child insane like the joker. Each child that marches down the alley is thus a twisted hybrid of Batman and the Joker's origin forced to live through the nightmare of both. Batman is incapitated as he is forced to watch children relive his own nightmare again and again. This is the same nightmare that motivates Bruce to become the Batman in the first place. It could be said that he became the Batman to stop this very thing from happening and now he is forced to watch it many times. 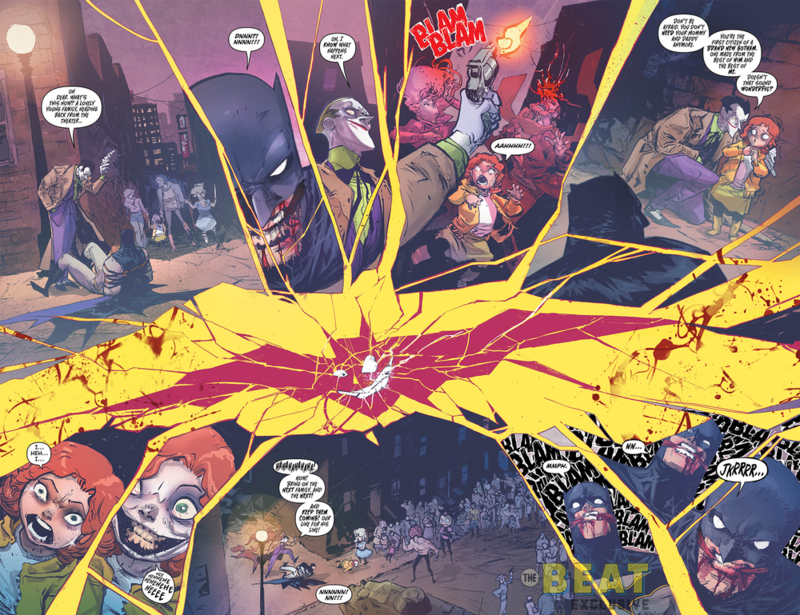 Eventaully, Batman escapes and brutally beat Joker. This time the Joker has managed to get Batman to do exactly what he wanted kill him. Batman kills the Joker. In works like the Killing Joke the idea of the Joker trying to get Batman to kill him has been explored as a kind of moral victory of the Joker proving his own philosophy correct. That even the disciplined Batman could be made into a killer under the right circumstances. In this universe there is an added twist. Joker has in his heart the original chemical that made him into the Joker. This chemical has been stewing away for years becoming increasingly potent. When he dies it is released and infects Batman. Batman never knowing of the chemical existence and not having the time to analyze it is unprepared. The chemical goes into his body and he is without an antidote. What happens is that Batman begins to descend into maddness fairly quickly. He methodically begins taking down first the whole Bat Family of heroes then the entire Justice League. He is able to use stratgies of Batman but in all ways twisted and darker and more demented due to his exposure to the Joker chemical. 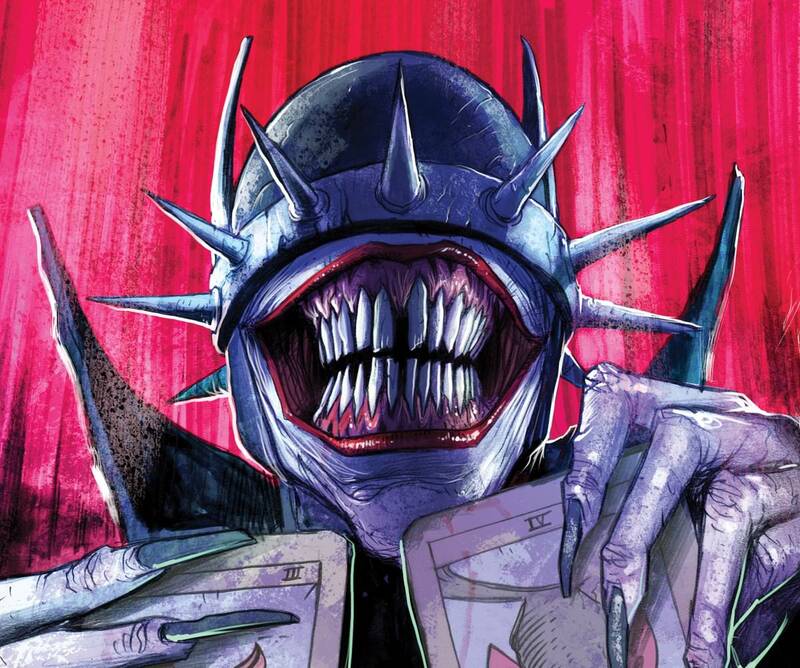 The Batman who laughs goes on to explain that in playing card terms he is a combination of the King and Joker card. He is the highest most power suited card, combined with the random and unpredicable quality of the Joker card. In so explaining this he reveals that he has his own goals that do not necessarily align with those of Barbatos.